Our butterfly valves are straightforward on/off routing valves with a substantial opening area and low flow resistance. 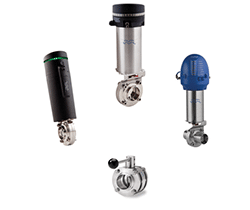 They are an optimal solution in modern processing technology and ideal for use with low and medium-viscosity liquids. Our LKB butterfly valve range consists of the following modular units that can easily be mounted in complex cluster set-ups alongside valves of other types: LKB or LKB-2 with standard spring-loaded locking handle for straightforward manual operation with a pulling/turning movement. LKB is used for ISO connection and the LKB-2 is used for DIN connection. LKB-F for flange connections to easily remove the valve body without dismantling piping setups. For both ISO and DIN. The LKB UltraPure butterfly valves are hygienic on/off valves for use with low and medium-viscosity liquids in personal care, biotech and pharmaceutical applications. All Alfa Laval Ultrapure equipment are delivered with the standard Alfa Laval Q-doc documentation package. Special flange version of the LKB butterfly valve that makes it easy to remove the valve body without needing to dismantle piping set-ups. This in turn makes it easy to undertake repair, service and replacement with a bare minimum of disruption. The Unique Control LKB automation unit with built-in actuator offers intelligent control for LKB butterfly valves used in all applications. This straightforward all-in-one actuator offers superior flow control, hygiene, durability and reliability.